Yesterday was one of the those days my mama warned me about. The morning started with Bacon summoning me to the kitchen. 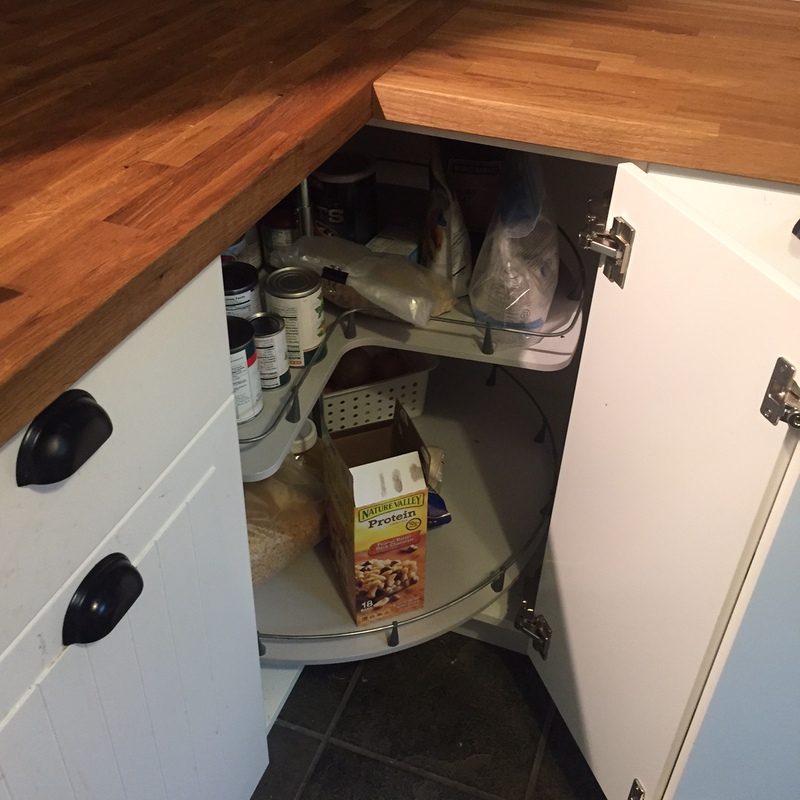 “This thing won’t turn.” He pointed to the lower shelf of the Lazy Susan in our corner cabinet. He tried to spin it. Grinding noises ensued. We said our thank yous and I’m sorries for wasting your time. He didn’t charge us for the service call, but he had a dumbest client story to tell for the ages. Scorched by idiocy, I sat down to do something that filled me with confidence. I wrote an email to the summer swim team about the upcoming season. I clicked send. After Apple Mail’s whoosh delivered the message to 250 addresses, I saw the math error in the fees, the contact list with an address I shouldn’t have used, and the calendar screw up. In an effort to make things clear, I confused everyone. My snafus moved on to higher stakes. 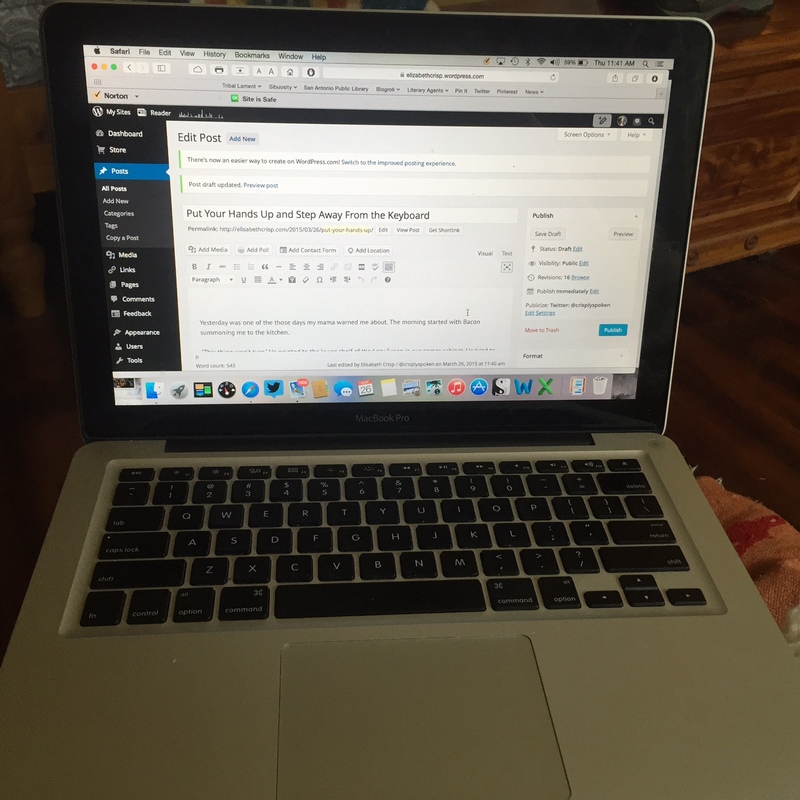 I poked around on WordPress, trying to choose a theme for the swim team’s blog. When my finger lingered too long in one place on my laptop’s touch pad, wham! I accidentally changed the theme for Crisply Spoken. My widgets were buried. My Gravatar was gone. Pinterest. Twitter. Goodreads. Kaput. I spent the next four hours attempting to rediscover fire. At midnight I crawled into bed with thoughts racing, cursing my stupidity. An hour later I was still awake. I hadn’t suffered enough, yet. I still hadn’t created the swim team blog. On my laptop, I clicked on “Add a New Blog” at the top of WordPress stats page. I entered the name and pushed submit. The rainbow-colored dot of fate rotated on my screen like my kitchen’s lazy susan. I waited. After the restart, Crisply Spoken, all of Crisply Spoken, graced the screen. I shut her down and went back to bed. I hope you like the blog’s new look. Sometimes a gift comes out of our darkest desperation, but I’d rather do my Spring cleaning without the angst. On the upside, I didn’t work on my novel at all yesterday. Thank God. Aw Thanks! It’s a lot of fun. When I’m not being an idiot behind a keyboard!